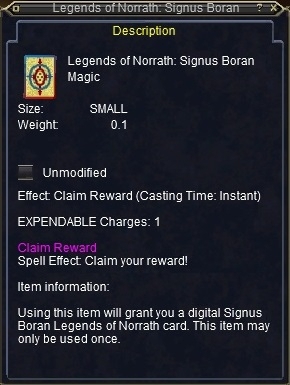 Using this item will grant you a digital Shu Fang Qui Legends of Norrath card. This item may only be used once. I just sold one today march 31 2013 on the bertox server for 11111pp. Was none in the bazarr so i just put in 5 random numbers and it sold within 2 days. One of these cards just dropped today from a restless alligator in Loping Plains. It sold pretty darn quick in the bazaar! Wonder if these are special in any way.